The year is wrapping up quickly! 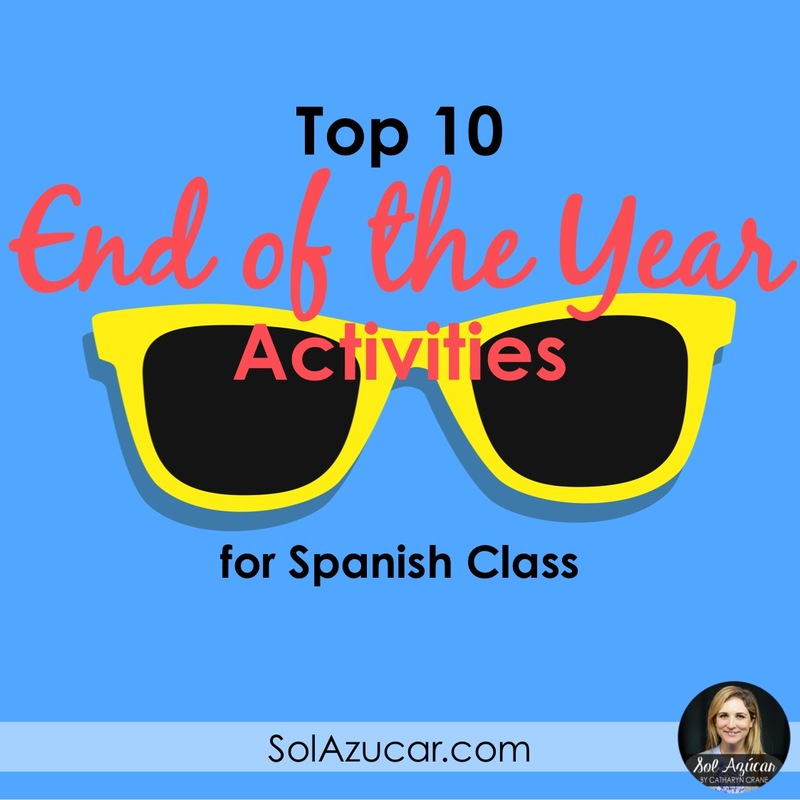 I figured we're due for a mention of some ideas for how to end the year right for middle and high school Spanish classes. I remember as a student teacher forcing my poor Spanish 1 freshmen to study for our final exam just like I was accustomed to studying for my university exams. I gave them a huge study guide with page numbers and verb charts, and expected them to dutifully look up all the topics and create their own notes from which to study. That tactic wasn't such a hit... shock! La Maleta Review by Fun for Spanish Teachers. These ideas might provide a little inspiration on how to incorporate game-based learning into your exam review. "Wheeeew. 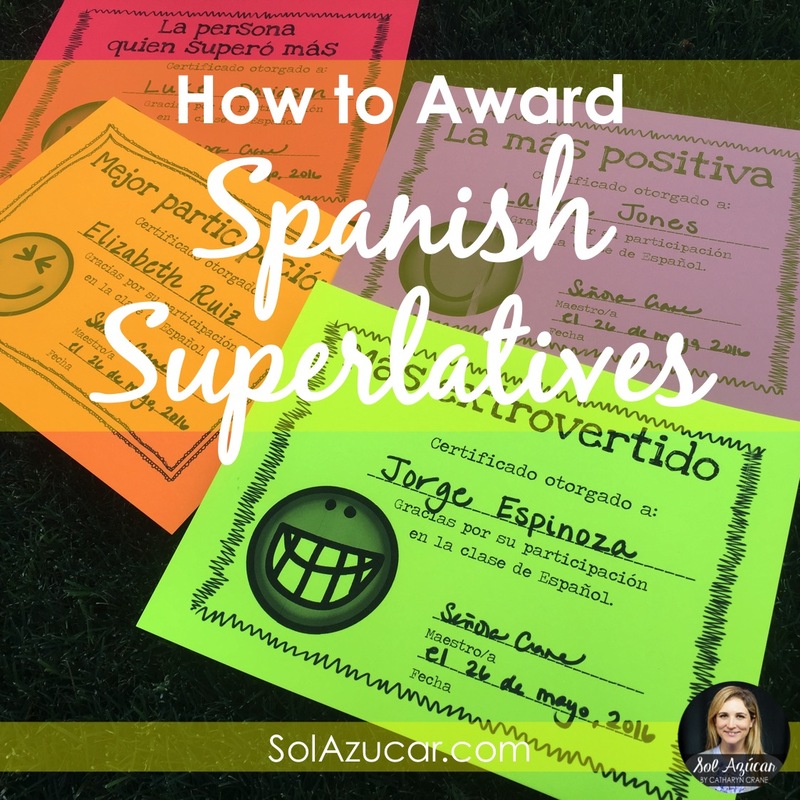 You made it through the subjunctive section! You are stronger than you know. It's all down hill from here. Let's finish this!" "You made it!! I’m so proud of how much Spanish you’ve learned since the first day of school. Have a wonderful break and see you next year!" "¡Terminaste ya! Ha sido un verdadero placer trabajar contigo este año. Has aprendido tanto. Espero que sigas tus estudios de español y que me visites el año próximo. ¡Que tengas un verano genial!" One of my biggest goals for my classes is to build a strong sense of community, where all the students in my class know each other well and feel safe to contribute and push themselves. You can't ignore that if you've built a strong community, at the end of the year, students will be sad to go. They have built relationships in class that (sadly) might not continue beyond your classroom. I always devote at least 30 minutes that last week or two of school for students to sign each others' yearbooks (I cal it open review time so even those who aren't doing the yearbook thing can stay busy). I always offer up that I'm happy to sign yearbooks too, and when asked always write a simple little note in Spanish. 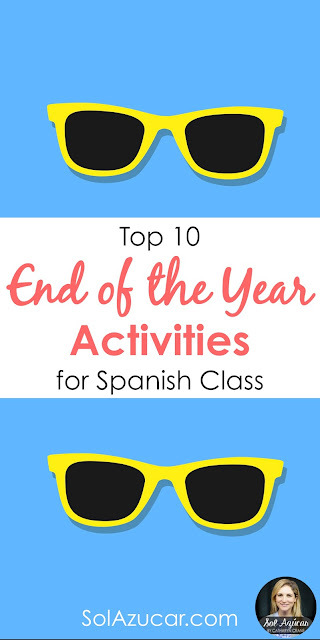 Another fun way to say good bye is with these little printable yearbooks, "Un Año Entre Amigos Yearbook Activity"by Mundo de Pepita. This is probably best for middle schoolers. This would be a great way to review but also get that closure that students really need as the year is ending. Asking students to look to the future can be a relevant way to incorporate a final assessment or to get feedback from your class. I love the idea of students writing a message to next year's class, with tips and advice. What a great way for teachers to get feedback about our classes. Could also be a useful assessment if students write in the target language. Another idea I love is having students write about their upcoming summer plans, using the future, conditional, or subjunctive tense. Alternatively, they could write about summers past using the past tense, or just about what they do typically in the summer using present tense. I love the way Emilie at Island Teacher has structured her "El verano de mis sueños" writing activity. It is heavily scaffolded and would make a great final assessment. I always thought this would be cheesy to orchestrate. But a few years ago, I had a student request that we get a class shot, and was amazed how into it all the students got. Everyone wanted a pic on their camera or phone. So now I do one with each of my classes. My juniors and seniors are way more into it than my freshmen, but in the end I think we all appreciate a nice photo for prosperity sake! Or movie dayssssssss, if needed! By the end of the year, its important to remember that students are just as stressed as teachers. A little down time can be good for the brain, body, and spirit! On years that we get through all the material quickly and I feel confident that students are well prepared for the final exam, I will often show a Disney movie in Spanish (I provide options... students vote). Or a timely animated movie is "The Book of Life" or "El libro de la vida". Completion of a video guide (check out this one by Loni Dai Zovi) could be a nice extra credit incentive or useful way to keep students engaged. If you have more than a few days at the end of your semester, consider showing Mi Vida Loca. This is the best FREE series I've seen for beginners. It includes 22-fifteen minute video segments, so would take a little time commitment. Check out my video guides (sample them for free) for this fun series. Last year I gave out end of the year award certificates each of my students, and they LOVED it. It was also a really nice closure for me. I got to call up each student, say a few nice words, and then give them their certificate. Some were silly, some were serious, all were thoughtful. 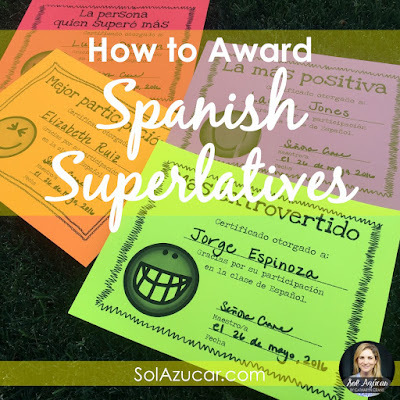 Check out this blog post where I explain exactly how to make and use these and also my own printable Spanish End of the Year Awards. Make students feel safe and comfortable by letting them know that you'll miss them in your class next year, but that you'll still see each other around school. Let them know that they can say hi to you, or drop by your classroom to talk. For my third year high school classes, where I only speak Spanish with them in class, I let them know that the Spanish only rule is over. They can come and find me and chat in English, Spanish, whatever. I also let them know that when they graduate, I'd be happy to be friends with them on social media, and that I'm always happy to write letters of recommendation or serve as a job reference. Like many of you, I'm always trying to improve my teaching and classroom environment. 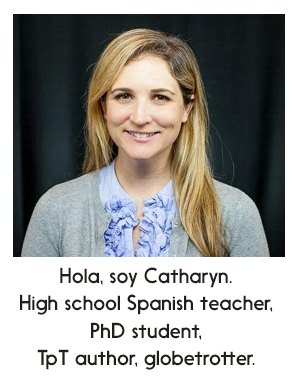 I've used exit surveys successfully over the years to get feedback from my students, and like Professora Frida's list of student survey questions, if you're looking for where to start. What was your most memorable activity in this class? Why? What was the hardest thing/easiest thing about this class? What did you dislike most about this class? How should I change the class for next year? Hope your school year wraps up nicely! Would love to hear your thoughts and ideas on wrapping up the school year. Please do share your comments below. What a comprehensive post with excellent ideas! What a great compilation of ideas! I've never added jokes and messages to exams, but it's a brilliant idea! Thanks for the post!